truly hope other counties will follow. simple, and very painful! These techniques ended with painful locks, chokes & throws! 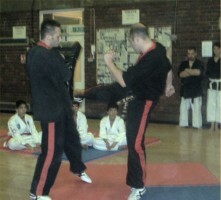 knees & an ankle break or take down! was highly incapacitated in most scenarios anyway! choke or hold. All of which Jamie demonstrated on his brother with effortless ease. applications & defensive combinations which employ this great little weapon. 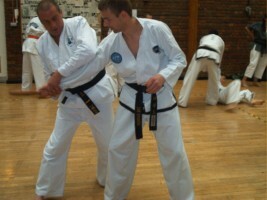 be used to disarm & control opponents & as a pressure point instrument. 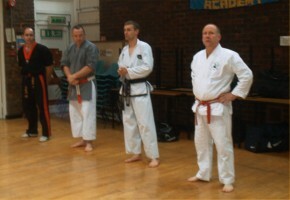 The final teaching segment of the seminar was taken by Wayne Timlin (2nd Dan Thai & Kick Boxing). 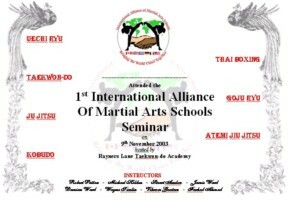 And this concluded the 1st International Alliance Of Martial Art Schools England Seminar. received a video of the event, filmed by Julie Anslow and all this for a fiver! enjoying every minute of it was very refreshing & very humbling for us all, it was fantastic. A big thank you to all the students & instructors that attended & made it such a great day. 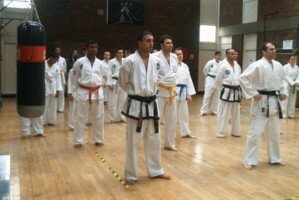 "Well done on the seminar, very well planned and definitely no time for getting bored. impossible, which on attempt seemed a lot more straight forward than expected. 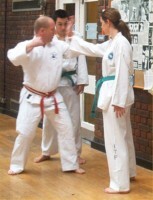 shown a few flashy moves and spinning techniques which were difficult to pull off for beginners, although the day was excellent, we didn't seem to learn many practical applications of the weapon so in that aspect we learnt a lot more in the IAOMAS seminar. 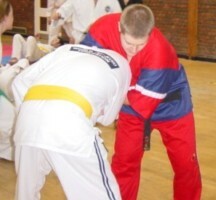 "Fantastic Seminar, really enjoyed the Kubotan work, I thought that I wouldn't enjoy the 9 shaped block section but the application of it was fun. It was good that we had to keep swapping people so that the classes mixed. Big thank you to the lads from Rochdale and to the those from Stuarts class who went to the Kebab shop afterwards - made me feel really welcome. Especially the Green Belt (Forgot her name) who gave me a lift. See you all next year in the 2nd Annual England IAOMAS Seminar." Peter.